So-called invisible illnesses (long-term conditions that have few or no obvious external symptoms) are an important field for study in the world of medicine. People who suffer from conditions that aren’t immediately apparent to other people can face many issues – from the severity of their illness not being taken seriously by the general public (“Well, you look fine to me…”) to a lack of social support when it comes to managing the symptoms of the condition. Technology, however, makes no such judgements; today, it is being increasingly utilized to make the managing of these conditions easier and more convenient for those who suffer from them. Technology plays an ever-more important role in the self-management of long-term conditions, from wearable technology such as FitBit, which can help people with fibromyalgia keep an eye on the amount of activity they engage in, to mobile applications such as MyFitnessPal, allowing patients with metabolic conditions such as diabetes to keep a convenient log of their nutritional intake. Diabetes, indeed, is a particular case in point – especially when it comes to mobile health. A condition that affects 30.3 million Americans (9.4% of the population), there are now more than 1,000 apps specific to diabetes management available to smartphone users, aiding sufferers in the monitoring of their diets, blood sugar levels, and insulin doses. However, researchers at Brigham and Women’s Hospital (BWH) in collaboration with the Veterans Affairs (VA) Boston Healthcare System wanted to know whether technology could be used beyond apps – which tend mainly to assist individual sufferers of diabetes – to improve long-term health outcomes at a wider level. 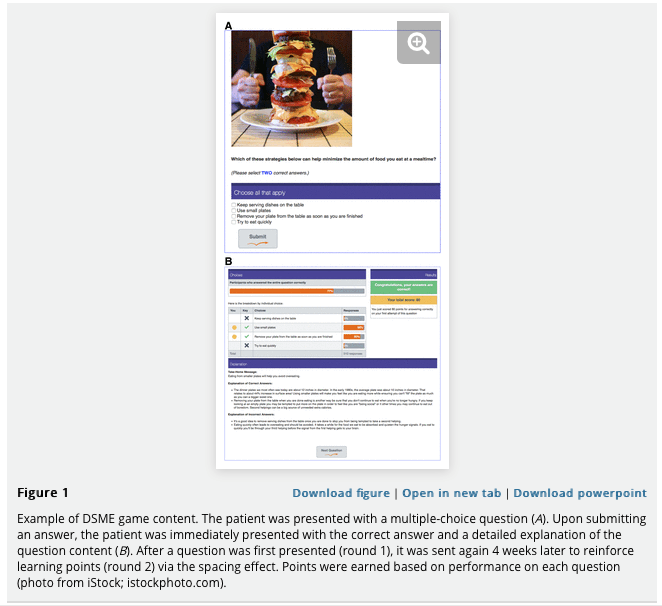 Specifically, they were interested to test their hunch that technology could be used to gamify the self-management of diabetes via team-based online games that introduced elements of community and competition into ongoing personal care. The research team set about designing a game which would educate patients about the management of their condition regarding diet, exercise and medication. They enrolled 456 Veteran Affairs patients with type 2 diabetes who had inadequate glucose control while taking oral medications. Half of the participants were randomly assigned a diabetes self-management education (DSME) game and received a printed booklet about civics. The other half – the control group – were assigned a civics-based education game, coupled with a booklet on DSME. The DSME game presented each player with a multiple-choice question related to glucose management, exercise, long-term diabetes complications, medication adherence, and nutrition. Participants were sent two questions via email or mobile app every Tuesday and Thursday for a period of six months. After submitting their answers, the correct answers were immediately presented, along with detailed explanations, a “take-home message”, and references. The same question would then be sent again four weeks later to reinforce learning. If an incorrect answer was given in the first round but a correct one in the second, the patients had the opportunity to receive the question a third time two weeks later in a bonus round. Correctly answered questions earned players “points”. Scores were posted on an online leaderboard, with participants (who were each assigned an alias to protect their identities) divided into seven teams based on their geographical location. The idea was that by making personal and team scores public, it would foster a sense of community between the participants and competition between the teams, and thereby encourage continued participation and effort. At the end of the testing period, the members of the team with the highest number of points each received a $100 gift card. In order to encourage continued participation from members of lower-performing teams, the top 30% of individual participants were also given $100 gift cards. Hemoglobin A1c (HbA1c), a common measure of overall blood-glucose levels, was measured before testing began, at the conclusion of testing (six months later), and then again six months later. 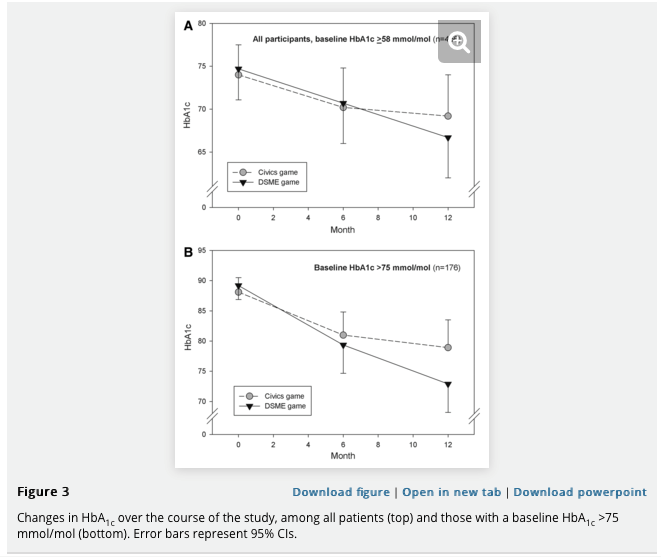 Those who had been randomly assigned to the group with the DSME game were found to have significantly reduced levels of HbA1c when compared to those in the control condition. What’s more, there was an inverse correlation between HbA1c levels at the end of the trial, and the severity of the patient’s diabetes at the beginning – i.e. the more severe the sufferer’s diabetes was, the greater the reduction of HbA1c, which continued right up to the 12-month mark. The results of the trial represent a promising step forwards in helping sufferers of diabetes to attain greater understanding of all the mechanics which underpin their condition, and thus gain the ability to better self-manage their symptoms. The isolating nature of invisible illnesses like diabetes can be one of the most difficult factors of a diagnosis to come to terms with. But through online social games, Brigham and Women’s Hospital is hoping to show sufferers they are not alone, while simultaneously improve the outcomes of their treatments. Hear Maureen Fagan, DNP, MHA, WHNP-BC, FNP-BC, Associate Chief Nurse at Brigham & Women’s Hospital, at Next Generation Patient Experience 2017 this November.